The list of CDAAC data users is now up to date, but it had been left for over a month without routine updates. We apologize for this delay. New METOP-A and METOP-B mission climate reprocessing. A new reprocessing of the METOP-A and METOP-B satellites GRAS receiver radio occultation payload has been done at CDAAC. It is available for download on the CDAAC Data Download interface and the FTP batch data download interface (select 'batch data download'). We have switched over to a next generation inversion software called 'newroam' (new Radio Occultation Atmospheric Monitoring) written by Sergey Sokolovskiy, and Zhen Zeng of UCAR. This software has been in development for several years now and is ready for production after a year-long testing process with weather centers including ECMWF, NCEP, and DWD. Many thanks to all who helped in the testing. New CHAMP mission climate reprocessing. CDAAC system was upgraded to version 4.1. No change to quality or quantity of data provided is expected. The CDAAC team has introduced a new way of fetching data via the web using a REST (REpresentational State Transfer) architecture. With this interface you can fetch a daily tarball of data for a specified mission, file type and day. Please let us know should you experience any errors with either interface, curl or web. The Web API has been proven to work best with Safari and Fire Fox. The object of this architectural change is the first step in our longer term plan of switching from providing single data files to daily tarballs, helping us to manage our growing data inventory better. The data files are the same as on CDAAC, but organized as monthly tar balls archived on CISL HPSS. Data requests through the "Data Access" tab at the above URL will be reviewed. Once approved, the requested data will be staged for downloading via web tools. This dataset requires the same access permission as on CDAAC's web site. Should you decide to download the COSMIC data from CISL RDA, please register on http://rda.ucar.edu (top page, upper left side). Please feel free to send your questions/comments to chifan@ucar.edu. The current version of BUFR files available from CDAAC and the GTS is edition 3. By the end of November, the WMO wants all edition 3 files to be phased out in favor of the more recent edition 4 BUFR files. Next week we plan to start delivering these files. Note that the version will change from the current '0001.0006' to '0001.0007'. Posted by Doug Hunt and the CDAAC Team. On our newly installed web/ftp machine (cdaac-www.cosmic.ucar.edu), a simple data batch delivery system is now available under CDAAC high-level web interface. The system allows registered users to submit data download requests and get notification when the downloadable archive is ready via the email addresses they used to register the account. We are currently given each user 5 GB quota per day, and the processed data archives will be kept on our server for 48 hours. Please try it out and help us improve the system, Thanks! To access the system, please visit: http://cdaac-www.cosmic.ucar.edu/cdaac/DBif/cdaac_highlevel.cgi and select the "Batch delivery data download." We will upgrade the web/ftp machine (cdaac-www.cosmic.ucar.edu) tomorrow (9/25/2012). There will be a short outage, hopefully less than one hour. This new web machine should have much higher capacity, allowing more downloads quicker. Also, as warned of in the Apr 10, 2012 announcement, we will shut down http access to cosmic-io.cosmic.ucar.edu next week, on October 2, 2012. There will be computer room maintenance done this weekend (4/28/2012) which will result in a short CDAAC outage. CDAAC is planned to be down for up to one hour starting at 12:00 UTC on Saturday 4/28/2012. More work in the computer room is planned during Saturday, so there is a chance the outage will last longer. Thank you for your patience! cdaac-www is a separate FTP and HTTP server which will have higher performance than the old cosmic-io server. Please change your wget scripts to use this new service! We plan on shutting down web access to cosmic-io in a couple of months. C/NOFS -- CORISS post-processing data (mission cnofs) have been added to the CDAAC web site. The data run from mid 2010 to the end of 2011. We hope to add more data soon. The data can be found at cdaac-www.cosmic.ucar.edu/cdaac/products.html#cnofs. METOP-A post-processing data (mission metopa) have been removed and replaced by the new climate reprocessing mission metopa2011. This mission runs through the end of 2011. Future months of METOP-A processing will be done with the latest version of the CDAAC software and will be stored in the metopa post-processing mission. METOP-A post-processing data will be offline for a few days while we copy in a new version. This new version is the first 'climate processing' for CDAAC. It is similar to post-processing (in that it is done in one month batches, based on single-day data groupings) but it only covers a fixed date range and care is taken to keep processing code and parameters strictly constant. All codes, data, and parameters used in the processing are carefully archived. This new reprocessing, called metopa2011 since it was started in 2011, runs from late 2007 to the end of 2011. Those who in the future want the most recent monthly processing of METOP-A should fetch the normal post-processing data under the metopa mission. A new version of CDAAC (version 3.13) has been installed at both CDAAC and TACC analysis centers. The main new feature of this release is the phasing out of the BINEX format for low rate LEO data (podGps file type). The accompanying uncompressed RINEX format files (podObs) will also be phased out. These files will be replaced by a new file type, podCrx which is in Hatenaka compressed, gzipped RINEX format version 2.20. podCrx files are just like podObs files, except they are compressed. Both CDAAC and TACC will switch over from podGps/podObs to podCrx files on Feb 7 at 00:30 UTC. It has been noted by Barbara Pirsher (Wegener Center/UCAR) that the 'wet' temperature and pressure values from the 'wetPrf' profiles are not consistent between missions. This is due to the fact that different background model data were used in the 1D-VAR assimilation that is used to compute these profiles. This table shows the model currently used for each mission available on the CDAAC web site. We plan on using the ERA-40 interrim reanalysis for future reprocessings. Posted by Bill Schreiner and the CDAAC Team. The CDAAC processes raw RO data into atmospheric profiles in near real time (within ~90 minutes of observation), 2-3 months after real-time with currently developed algorithms (i.e. post-processed solution), an also periodically re-processes all RO missions every 1-2 yrs with consistent software and algorithms to provide the most accurate and stable products for use in climate studies. Newly re-processed data products are now being made available on the CDAAC website as soon as they are processed and vetted. The Table on our Data Center page summarizes the availability of these consistently re-processed data. Although the product version numbers differ, these data products are considered consistent (i.e. processed with similar algorithms) by the CDAAC Team and are the most suitable CDAAC products to use for climate studies. Posted by the CDAAC Team. We are now making available real-time radio occultation data from the Argentinian satellite SAC-C.
COSMIC FM1 was returned to service on day 2010.286 (Oct 13, 2010) after a 10 day firmware test period in early October 2010. COSMIC FM3 has been out of contact since Aug 1, 2010. COSMIC FM5 went out of contact Sept 26, 2010 and then returned to service Nov 10, 2010. All COSMIC spacecraft (FM1, FM2, FM4, FM5, FM6) are experiencing some level of battery degradation. COSMIC and other RO mission data are now being processed and made available with CDAAC Version 3.0. Metop/GRAS (Global Navigation Satellite System Receiver for Atmospheric Sounding) processed data are now available on the CDAAC website. The CDAAC processing utilizes both closed loop and raw sampling (open loop) data. Interpolation is used to fill data gaps of up to 1 second. Data are currently available for early 2010 and additional data will be made available as they are processed. FM1 will be offline for approximately one week for testing of new GPS Occultation firmware. The new firmware should improve occultation counts. It will also allow L2C tracking, improved tracking for rising occultations, better diagnosis of antenna problems, and high rate ionospheric amplitude and phase data for reference satellite tracks. Another update will be posted when FM1 is back online. Please contact Bill Schreiner (schrein@ucar.edu) should there be any questions. New FTP server for CDAAC products! The machine cdaac-ftp.cosmic.ucar.edu now contains all CDAAC post-processed data. Users are requested to use this service instead of using wget via http from cosmic-io.cosmic.ucar.edu. Users with data access accounts for CDAAC will be able to use their current user id and password for this new service. For real-time data, users should still go to http://cosmic-io.cosmic.ucar.edu/cdaac/, but real-time data will be added to the FTP server soon. A separate announcement will be made at that time. Please contact Doug Hunt (dhunt@ucar.edu) should there be any questions. On Monday, Jan 25 post-processed data products for all missions will not be available. We are moving our data server to make way for a new FTP service for post-processed and (later) real-time data. On Tuesday, Jan 26 data access to post-processed products will be restored (web and wget). New COSMIC absolute TEC arc files (podTec) are available for days 2008.001-2009.151. Due to a bug in the code, many arcs had previously not been generated. There is no change in the data quality, but over twice as many arcs are now available. Please contact Xinan Yue (xinanyue@ucar.edu) should there be any questions. As of October 12, 2009 00:00UTC, the CDAAC near real-time data products now include the changes explained in COSMIC status updates from April 16, 2009 and May 12, 2009. In addition, future CDAAC post-processing results will include these changes starting the month of April 2009. These new results are designated with a new version number (2009.2650). Starting October 12, 2009 00:00UTC, the CDAAC near real-time data products will include the changes explained in COSMIC status updates from April 16, 2009 and May 12, 2009. In addition, future CDAAC post-processing results will include these changes starting the month of April 2009. These new results will be designated with a new version number (2009.2650). A new version (2007.3200) of GPS/MET data is now available. The new GPS/MET dataset is processed with the current version of the CDAAC software. This new processing results in more (~20%) successfully retrieved profiles for AS- (Anti-spoof) OFF periods and with similar error characteristics as compared to the old dataset (2005.1720). However, the new processing results in fewer successfully retrieved profiles for AS- (Anti-spoof) ON periods with similar error characteristics (as compared to the old dataset) due to a more stringent quality control procedure. The AS-ON data were processed with heavy smoothing of reference link and occulting link L1-L2 phase to minimize the high level of AS-ON L2 noise. The AS-OFF data are stored in the gpsmet mission. The AS-ON data are stored in the gpsmetas mission. Please contact Bill Schreiner (schrein@ucar.edu) for further details. The current version (2005.1720) of GPS/MET data will be unavailable until further notice, because a new version (2007.3200) of the data are currently being copied to the public website. A notice will be posted on the website when the new GPS/MET data are available for download. The new GPS/MET dataset (2007.3200) is processed with the current version of the CDAAC software. This new processing results in more (~20%) successfully retrieved profiles for AS- (Anti-spoof) OFF periods and with similar error characteristics as compared to the old dataset (2005.1720). However, the new processing results in fewer successfully retrieved profiles for AS- (Anti-spoof) ON periods with similar error characteristics (as compared to the old dataset) due to a more stringent quality control procedure. The AS-ON data were processed with heavy smoothing of reference link and occulting link L1-L2 phase to minimize the high level of AS-ON L2 noise. Posted by Sergey Sokolovskiy and The CDAAC Team. Recently we found that the sliding median filter that we applied for the the phase of the signal transformed to impact parameter representation by Full Spectrum Inversion results in a positive bias in bending angles below 6-8 km (refractivity and subsequent products are also affected). We replaced the median filter and increased the up-sampling of the transformed signal (to ensure elimination of cycle slips). These two changes effectively eliminated the bias. 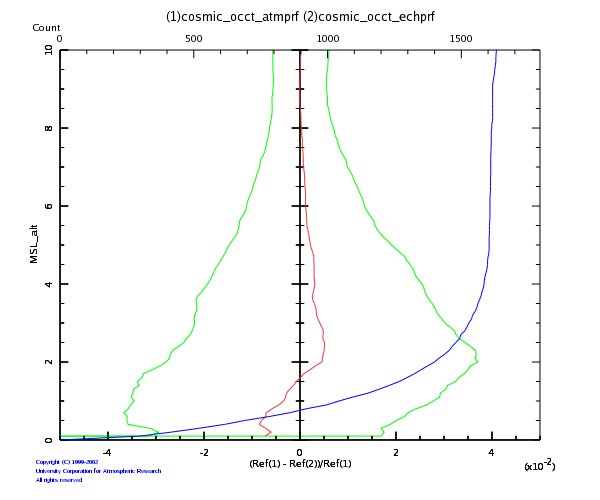 Left and right figures show statistical comparisons of refractivities between COSMIC and ECMWF analysis for July 1, 2007 before and after elimination of the bias. The changes will be applied for real time processing and post- processing after testing of the data by operational weather centers. Additional announcements will be posted at that time. Recently it was found that the filtering used in our inversion software produces a positive bias in the retrieved bending angles on the order of 0.1-0.2% above 10-20 km. This bias propagates into refractivity and, subsequently, into other retrieved profiles. We replaced the filtering which reduced this bias by several orders of magnitude. Currently the updated data are being tested by operational weather centers. We will post additional announcements when this change is applied to our real time and post-processed data products. Thanks to Christian Marquardt from EUMETSAT for alerting us to this issue. A bug has been discovered in COSMIC ionPhs and ionPrf files on CDAAC. For certain satellites and days, ionPhs and ionPrf profiles are scrambled, showing many abrupt jumps. This problem occurs for COSMIC satellites which have SNR problems on one of the POD (Precise Orbit Determination) zenith-mounted antennas. These satellites have had the failing antenna turned off and thus have only one POD antenna for tracking ionospheric occultations. A bug in CDAAC software improperly mixed data from duplicate tracks on the single POD antenna. A software patch was applied on day 2009.076 to fix this bug in the real-time COSMIC processing. We will fix the problem in the post-processed data and send out a separate announcement when this is complete. Thanks to Qian Wu (NCAR HAO) and Woo-Kyoung Lee (HAO and KASI, Korea) for finding this problem. The status of the 6-satellite constellation remains largely unchanged. Almost three years into the project operations are going well with over 3.2 million quality checked neutral atmospheric (1.5M) and ionospheric (1.7M) profiles delivered. Depending on the state of the constellation we are obtaining between 1400 - 2300 good soundings per day. Two spacecraft (FM2 and FM3) continue to have power problems but show no sign of further degradation. The issue of the signal-to-noise ratio (SNR) drops from some of our antennas still remains unsolved. A detailed study trying to correlate these SNR drops with a multitude of spacecraft parameters such as solar angle, receiver temperatures, power conditions etc. did not lead to any conclusive explanation so far. Presently we have low or no signal from 3 orbit determination (POD) antennas and from one high-gain occultation antenna. Much of the work at CDAAC is currently focussed on the understanding of various small biases in the data set. Small negative stratospheric biases can be caused by residual ionospheric noise. Small positive lower tropospheric biases are caused by low SNRs that affect occultations observed in off-bore-sight directions where antenna gain is lower. We are also in the process of revising our filtering algorithms aimed at bias reduction. Our work is aimed at reducing and quantifying these errors for COSMIC and at avoiding them in future missions. CDAAC is continuing its work towards becoming a multi-mission processing center. We are re-processing GPS/MET and processing the data from all missions that allow us access to their data. Currently we are working with colleagues from EUMETSAT to process METOP-GRAS data starting from raw level zero observations. We expect that COSMIC and METOP-GRAS comparisons will provide new insights into the quality of radio occultation data, and we greatly appreciate to cooperation from EUMETSAT. EUMETSAT is providing ground fiducial data to COSMIC and has recently agreed to also provide these data to our partners at TACC in Taiwan. CDAAC has hired a new scientist who will be responsible for our ionospheric processing. Dr. Xinan Yue received his PhD from the Chinese Academy of Sciences in Beijing in June 2008. He is expected to start in his new position in early 2009. A joint JPL / NOAA / UCAR radio occultation (RO) workshop will be hosted by JPL in Pasadena CA April 7-9, 2009. The purpose of the meeting will be to develop documents to help guide future operational and research radio occultation missions (RO). The agenda will include: Day 1 - Agency and science requirements for RO, Day 2: Hardware and mission providers capabilities, Day 3 Engineering issues and wrap-up. Posted by Chris Rocken, Bill Schreiner, and the CDAAC Team. All six Formsat3-COSMIC satellites continue to operate. While previously reported problems persist (i.e. FM2 has only one working solar panel, and FM3 has a stuck solar array drive), no new problems have occurred and the mission is currently producing between 1500 - 2500 profiles per day. COSMIC FM2 recently went into phoenix mode (payloads turned off) for 35 days from 2008.212-246. The reasons for why the spacecraft shut itslef down and why it decided to come back are still under investigation by the NSPO operations team. New results of tracking the L2C signal were presented jointly by JPL and UCAR at the ION conference in Savanna and the paper was selected as best paper in its session. The results for the first time demonstrate open loop L2 tracking and show that L2C data can benefit RO profiles in the troposphere. The COSMIC team has supported several meetings including the Unidata Latin American Data users workshop, which inspired several new radio occultation data users from that region of the world http://www.unidata.ucar.edu/events/2008LatinAmericanDataWorkshop/. The Formsat-3/COSMIC workshop was held Oct 1-3 in Taipei, Taiwan with strong participation by scientists from Europe, Japan, Brazil, the US and Taiwan. Impressive results from the use of COSMIC data in weather forecasting, hurricane/typhoon prediction, ionospheric research and climate studies were presented. The workshop was followed by productive discussions of a possible COSMIC follow-on mission. All six satellites are operating. The daily occultation count ranges from 1600-2200 good neutral atmospheric profiles. FM6 has good SNRs for both high gain antennas, an improvement since the April 2008 update, which is believed to be caused by lower antenna temperatures. The daily occultation count remains limited by the problems described previously: FM2 has only one working solar panel, FM3 has a stuck solar array drive - both of these conditions require to turn the payloads off at times, depending on the solar angle. One of the POD navigation antennas on FM5 still has low L2 SNR so that this satellite has to be operated with only a single POD antenna. While the daily count for the mission remains lower than anticipated individual well functioning satellites like FM4 can generate over 500 high-quality soundings on good days. After uploading a new version of JPL-modified firmware the COSMIC mission has collected the first profiles tracking the new GPS L2C signal. The data are still undergoing testing but initial results indicate significantly improved penetration into the lower troposphere when tracking the L2 phase. Open loop tracking of L2C is also performed but CDAAC software is still being modified to process those data. The new NOAA-supported ground stations in Fairbanks, AK, and Tromsoe Norway, are performing well. After some initial-startup problems reliability is now as good as it has been before we switched ground stations. An additional ground station in McMurdo, Antartica, is now being prepared for support of 6 COSMIC passes per day. This ground station is owned by NSF and operated by NASA and it is expected to reduce the latency of some COSMIC products. After a period of relatively low daily profile count the COSMIC constellation is now recovering and presently reaching again ~1500 profiles per day. FM3 had shut down its GPS receiver for several weeks because of low power conditions. FM6 produced very few profiles because of severe attitude problems. The National Space Organization (NSPO) in Taiwan recently managed to overcome both of these problems. All six satellites are functioning again - but some problems remain: FM2 has only one working solar panel, FM3 has a stuck solar array drive - both of these conditions require to turn the payloads off at times, depending on the solar angle. One of the POD navigation antennas on FM5 still has low L2 SNR so that this satellite has to be operated with only a single POD antenna. One of the high-gain occultation antennas on FM6 recently began to display low L2 signal-to-noise ratio (SNR). The cause for this new problem is still under investigation but presently it has the effect that we obtain only setting or only rising occultations from FM6. New GPS receiver firmware has been delivered by JPL and was uploaded by NSPO to all satellites. The new firmware has modifications designed to increase the count of successfully scheduled and tracked occultations. With this new firmware it is now possible to obtain well over 400 good profiles per day per satellite provided that there are no other problems related to attitude, power, or low antenna SNR. The new firmware will also enable us track the stronger L2C signal transmitted by some of the newer GPS satellites but this has yet to be demonstrated. The COSMIC program has received confirmation of funding for the next three years from its sponsoring US agencies, NSF, NOAA, NASA, and USAF. Taiwan is also planning on continued support for the Formosat3/COSMIC program. COSMIC is working on switching from the two commercially operated ground stations at Fairbanks, AK and Kiruna, Sweden to two NOAA-owned ground stations in Fairbanks, AK and Tromso, Norway. The new stations are presently undergoing extensive testing and the switch will take place in mid-April, 2008. After this we are planning to use the new stations for the next three years. Real-time COSMIC products are now freely available via UNIDATA's LDM software. We hope that this new service will lead to new research and creative applications of the data to real-time applications. We now have the capability to distribute our data via LDM -- Local Data Manager -- an event-driven data distribution system. Please contact Karl Hudnut at: khudnut@ucar.edu if you are interested in receiving our data sets via LDM. We are currently sending 'wetPrf' and 'bfrPrf' files via LDM and will expand this list if there is sufficient interest, so please also specify the file types you would like. Please note: COSMIC and CHAMP highlevel products have been reprocessed and are available on our Website. After a gap of 2 months (from day 252 - 317, 2007) FM6 started to provide data again on day 318 of 2007. The reasons for this long gap are still under investigation. Data from FM6 are looking good and are provided to users. Power issues with FM2 and FM3 remain unchanged and the amount of data obtained from these satellites depends on the solar angle. We have discovered an anomaly in CDAAC data processing which has now been corrected. During periods when the LEO receiver time and GPS time differed significantly our profiles were affected by added noise. This was noticeable above 20-25 km altitude. These periods of added noise were sporadic and different for different FMs. Our real-time processing software has been fixed to account for these clock offset periods, is now undergoing testing, and is scheduled to run on our production machine starting Monday November 19, 10am Boulder time. We are also beginning to re-process all our post processed data. Re-processing should be completed in a few weeks. As part of this re-processing, COSMIC post processed data (mission 'cosmic') will be temporarily unavailable. We have been working with JPL to find ways to increase the percentage of profiles that are inverted successfully. Sometimes as many as 50% of receiver-scheduled profiles fail in the CDAAC processing chain for a variety of reasons. Upgraded firmware, which will be uploaded to LEO receivers, with changes in the way reference satellites are scheduled, and in the way L2 is tracked for setting occultations, is expected to increase the percentage of profiles that pass successfully through all of our processing steps. The daily occultation count has recently dropped to ~1200 due to several reasons. (a) We have lost contact with FM6. Efforts are underway to re-establish contact to this satellite. (b) The solar panels of FM3 are stuck resulting in non-optimal power and limited payload operation for this spacecraft. Efforts are underway to determine what happened and to try to move the solar array drive (SAD). (c) Orbit raising for FM3 has been halted and the satellite will remain at ~700 km altitude for now. (d) FM2 still is operating with only one solar panel and payloads are operated only part of the time. FM1 orbit raising has begun. CDAAC plans to switch to processing with version 2.0 software during the week of Sept 17-21, 2007, which should result in a slightly improved success rate of profiles that pass our quality control. We anticipate an improvement of ~ 5%. New flight software which also should increase the number of occultations that we track is presently undergoing testing at JPL. Once these tests are completed we expect to upload this software in the next few weeks. Meteo France has begun use of COSMIC data operationally - making it the 4th operational weather center to do so. The satellite constellation is approaching final deployment with only one more spacecraft, FM1, remaining its initial 500-km orbit. Presently the system is producing 1500-1700 good neutral atmospheric soundings per day with an average latency of about 2 hours. New firmware (FB 4.4) was provided by JPL and uploaded to satellites FM5 and FM6. This firmware enables operations if only the fore navigation antenna (POD) is working and was needed for FM5 and FM6 which experience intermittent problems with one of their two navigation GPS antennas. The firmware also improved L2 tracking and produced the first tracking data of the new L2C GPS signal. However it was decided to not upload FB 4.4 to all satellites until several firmware improvements and bug fixes can be applied. Power limitations on FM2, orbit raising of FM3, low SNRs on one of the navigation antennas of FM5, and recent attitude control problems on FM6 limit the number of daily profiles to the current level. CDAAC software version 2.0 is nearing completion with several improvements including post processing capability, new data gap processing, and improved phase data filtering. CDAAC has begun re-processing of all COSMIC data. This analysis is in progress and it takes about 18 hours of CPU time on our new Linux cluster to process 1 month of COSMIC data. Don't forget to register and submit an abstract for the Second Formosat-3 / COSMIC Workshop in BoulderOctober 22-24. The number of daily soundings has temporarily dropped below 1000. This is caused by several issues. (a) We have uploaded new GPS receiver firmware version 4.4 to FM6. While we are testing/validating this new firmware this satellite has been taken off line. (b) FM3 is currently raised - this affects data from FM3 and also the number of data dumps from the other spacecraft. (c) FM2 is only operated during a small fraction of the day because of power limitations. (d) FM5 is producing only very few rising occultations because of continued low L2 SNRs on the fore POD antenna. We expect that most of these problems can be resolved soon and that we will be able to provide more daily soundings. Reprocessed CHAMP data from 2001 to 2007 is now available online. These results include more occultations and are better suited to climate applications, since they are all processed with the same code. Count of daily occultations still ranges between 1400-1800 soundings per day. A GPS receiver firmware upgrade is undergoing testing at JPL. This upgrade is expected to further improve profile quantity and quality and it is designed to help with the Signal to Noise Ratio (SNR) drop anomalies mentioned below. All six satellites and payloads are functioning. Only FM1 and FM3 remain in the low orbits, all other satellites have been raised to about 800 km The final constellation shall be reached by the end of October 2007. FM2 appears to have lost one of its two solar panels and operation of its payloads had to be reduced. FM2 TIP and TBB have been turned off and GPS is operated, depending on solar angle between 10%-90% of the time. We are still experiencing periodic drops in SNR from some of the GPS antennas in the constellation which leads to periodic data loss. The reason for these events is under investigation. The COSMIC team is working with NOAA and the UKMO to improve the latency of the BUFR profiles distributed over the GTS to operational centers. These BUFR files are frequently delayed many hours. This is expected to be fixed very soon. NOAA/NCEP went operational with COSMIC on May 1st 2007 along with the implementation in operations of the new NCEP's Global Data Assimilation System (GSI/GFS). The UKMO has begun operational assimilation of COSMIC profiles on May 15, 2007, joining the ECMWF and NOAA/NCEP. Posted by Chris Rocken, Dave Ector and Lidia Cucurull. We have had some satellite problems over the past couple of months with satellites FM1, FM2 and FM6. These problems have reduced the number of soundings from a peak of over 2400. We have recovered on FM1 and FM6 but due to remaining problems with FM2 and orbit raising maneuvers on FM4 we are presently generating ~1700 profiles / day. The cause of the anomalies with the GPS receivers on FM1 and FM6 has not yet been resolved. All three FM2 payloads are currently turned off while problems are being investigated. We are hoping for a resolution to these problems and remain committed to the goal of 2500 neutral atmospheric profiles per day. Satellites are still being raised with half of the satellites in their final orbits above 800Km. Both NOAA/NCEP and UKMO are planning to begin using COSMIC RO data operationally within a few months. NOAA / SEC has expressed interest to obtain COSMIC space weather data in real-time and the COSMIC team is working with them on this. JCSDA: GSI/GFS with COSMIC data is running in real time in parallel to operations for implementation in operations as the new NCEP Global Data Assimilation System. Satellites are are still being raised to move into final position. New version 4.3 firmware has now been loaded to all 6 satellite's RO receivers. Half of the satellites are now in their final orbits of above 800Km. Orbit raising is continuing on the other satellites, and will continue over the next 10 months - though we are now beginning to see fairly even daily global coverage with the COSMIC constellation. Numbers of payload data downloads have increased considerably to between 50-60 per day, reducing data latency and increasing numbers of soundings which can be used for realtime weather forecasting. We are presently experiencing an anomaly with one of the 2 POD antennas on FM6 - while investigating this, CDAAC has taken FM6 off-line. Prior to this we had reached over 2200 soundings per day. Assuming that all six satellites remain fully functional we expect that the mission requirement of 2500 atmospheric soundings per day should be reached, after the next firmware upgrade that we are discussing with JPL. TIP and TBB operations are ongoing successfully. Radio occultation profiles in WMO approved BUFR format are now distributed via NOAA/NESDIS through the GTS. CDAAC is pushing the profiles to NESDIS with about 90-min latency of on-orbit collection - clearly exceeding the mission goal of 180 minutes average latency. JCSDA: Started a parallel run with the assimilation of COSMIC soundings with the final (and implementable) version of the GSI/GFS code. We selected refractivity as immediate use of COSMIC in operations. All satellites are healthy and orbit raising is still continuing with 3 satellites near final orbit. All 6 are still being spread apart to maximize download capability. We are averaging around 1600 soundings per day. Days which have orbit raising activities (satellite burns) have reduced numbers of soundings -- GPS payload is turned off on the scheduled satellite. The constellation is in the process of receiving a new firmware upload for the GPS RO receivers which will add some capability including addition of capability for S4 index collection. TIP and TBB operations are ongoing successfully. Another milestone development is that the ECMWF began using the COSMIC data operationally on Dec. 12, 2006. JCSDA: Continuing to do parallel data assimilation runs with a new version of the GSI/GFS code. Validation against radiosondes shows a global reduction of the bias and RMS error when GPS RO observations are being assimilated into the system. Final tuning of the next generation NCEP global data assimilation system is underway prior to operational implementation. All satellites are healthy and orbit raising is still continuing with 2 satellites near final orbit. All 6 are being spread apart to maximize download capability. Due to this, we expect to be able to increase our average number of payload dumps and soundings per day towards the end of the year. Currently, we are averaging around 1200-1600 soundings per day. Days which have orbit raising activities (satellite burns) have reduced numbers of soundings -- GPS payload is turned off on the scheduled satellite. TIP and TBB operations are ongoing successfully. At 2006 Fall AGU in San Francisco there were several events related to COSMIC. There was a press conference, a neutral atmosphere session (and posters), a space weather session (and posters), and a mini-workshop discussion issues related to climate monitoring. The interest in COSMIC remains strong and feedback on data is positive. 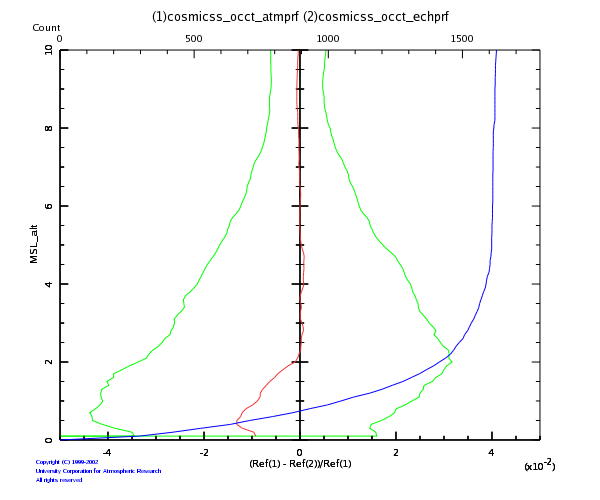 Another milestone development is that the ECMWF began using the COSMIC data operationally on Dec. 12, 2006. JCSDA: Earlier parallel runs show a significant improvement on the stratospheric bias when observations of bending angle are assimilated into the model. A global improvement in skill is evident in the Southern Hemisphere. Results are very encouraging. At this moment, three cycling experiments are underway: (1) a control, with the assimilation of observations available in operations, (2) a run with observations of bending angle on top of the ones used in the control, and (3) a run with observations of refractivity on top of the ones used in the control. All the experiments are being cycled for a month. Based on the results, it will be decided which type of COSMIC GPS RO data type (bending angle or refractivity) will go into operations along with the implementation of the new Global Data Assimilation System at NOAA/NCEP. COSMIC operations are going well with 1400-1800 soundings per day - several days had over 1800. The latest increase was achieved by opening the azimuth angles for occultation observations. The satellites went through a phase where they are exposed to sunlight almost permanently and this resulted in some loss of data. There has been a lot of focus by NSPO operations on orbit raising. FM 2 is now joining FM 5 at altitudes of close to 800 km. Satellites are being spread within the planes as well to prepare for more data dumps - less clustering. UCAR and JPL are working on the next load of firmware which will widen the occultation antenna angles, and allow for another increase in sounding numbers. This next load should be on board by mid December. A COSMIC / Formosat-3 press conference is planned for the Fall AGU on Monday Dec 11, 1400h (location TBD). The panel of Anthes, Cheng and Rocken will talk to the press. A special climate workshop is also planned for the AGU on Tuesday evening Dec. 12, 1930h - 2200h San Francisco Marriott (room Sierra H), J. Anderson, S. Leroy, T. Mannucci, and C. Rocken are co-conveners. NCEP: The assimilation of COSMIC data into the GSI - next generation of NCEP's data assimilation system - is now being tested in the new computer (NCEP is in the middle of a computer upgrade, which includes the Primary and Backup operational systems as well as the development systems). We also continue parallel runs with COSMIC data to select the optimal Forward Operator (refractivity or bending angle) for operations. Posted by Dave Ector, Chris Rocken and Lidia Cucurull. An increasing number of data users are using 'internet download accelerator' programs to fetch data from the CDAAC web site. Normal web clients (such as 'wget') fetch files one at a time. By contrast, these 'accelerator' programs launch dozens or hundreds of simultaneous requests for multiple files and multiple portions of a given file. This type of client can flood our server making access impossible for other users. In order to be fair to the rest of our users, we are now suspending any user that we find using one of these programs. We will email you if this is the case and re-instate your access when you reply that you understand not to use these web clients. We are also looking into ways of making our data available more quickly-- please be patient during this initial phase of our operations! COSMIC operations are going well with some days collecting around 1500 soundings in a day. We have had a few problems with our payload data connection from the Alaska ground station - 2 communications outages, server failures, etc, but those problems appear to be fixed. The satellites are healthy overall with a momentary pause in orbit raising. This is expected to restart early November. The first COSMIC/FORMOSAT-3 Data User's Workshop was held in Boulder, October 16-18th. We had nearly double the expected number of attendees, positive feedback about data quality and availability and interesting initial science results. Some of the highlights included initial positive impact of COSMIC data on the ECMWF model in the northern hemisphere, use of the COSMIC data to detect model errors over the Antarctic, and promising initial results for hurricane forecasts. In space weather we saw very encouraging results validating the COSMIC electron density profiles against incoherent scatter radars and significant progress towards assimilation of the data into ionospheric models. Posted by Dave Ector and Chris Rocken. COSMIC operations continue to improve with all satellites healthy, producing an average of between 1000 and 1200 RO soundings per day. We have managed to get as high as 1600 RO soundings in a day but are now back to focusing on orbit raising. NSPO has raised a 2nd satellite to 700+ km, and is now starting on the third. This is a slow process because be are depending on orbit precession to get all the satellites into their final locations. As satellites spread out, the numbers of data downloads and numbers of occulations will grow. CDAAC is steadily improving the processing of data, fixing and tuning the system in support of 24/7 operations. All six s/c and all payloads are healthy. Numerical weather centers report that the data look "very good" and that the quality of rising and setting occultations are comparable. The Taiwan control team at NSPO restarted orbit maneuvers around the 4th of September with FM2 now moved from just over 500 km to just over 600 km altitude. We were expecting a sizable decrease in the numbers of soundings, but due to good resource management, NSPO has managed to keep the numbers of occultations around a thousand per day on average. Some days have more soundings than others due to burn activities and scheduling. Overall, the users have been reporting the quality of the occultations to be very high. TIP operations are improving due to correction of some timing issues, and TBB has completed an equatorial irregularities campaign at Kwajalein in the Marshall Islands. Number of registered users is up to 239 and data access to CDAAC is heavy - so heavy in fact that we had to throttle allowable download rates. CDAAC requested and received approval from the GRACE to start processing GRACE radio occultation data. CDAAC was also informed about two upcoming launches of radio occultation instruments. (a) RoadRunner Launches on a Minotaur out of Wallops, Virginia scheduled for November 13th (2006); (b) TerraSAR-X launches on the Dnepr rocket in Russia, scheduled for October 31 (2006). While Formost-3/COSMIC clearly remains our first priority CDAAC will also attempt to process data from these additional missions. Please note the September 17th deadline to sign up and register for a presentation at the Oct. 16-18 "First Formosat-3/COSMIC data users workshop". On 28 August, COSMIC processed over 1300 good atmospheric soundings for a new record. The daily soundings number is still growing as adjustments are made to the receiver configurations, and the Taiwan control team steadily increases the number of downloads. Satellites remain healthy as the control team prepares to restart constellation orbit raising on 4 September. Over the past several weeks, the science community has been enjoying a steady growth of soundings numbers, partly due to the fact that orbit raising has been on hold. As we move back into a season of orbit adjust burns, occultation numbers may decrease again until the satellites are no longer clustered together. TIP operations are improving due to correction of some timing issues, and TBB is preparing for an equatorial irregularities campaign at Kwajalein in the Marshall Islands. Some CDAAC statistics. Between August 1-12 106 separate users downloaded 519 Gb of data in 1.7 million files. COSMIC has 220 registered and approved users. On 17 August, COSMIC had its first day of over 1000 good atmospheric soundings. This number is significant, because it represents close to the number of worldwide radiosondes launched per day. The percentage of successfully processed (passing all CDAAC quality checks) rising occultations is now very close to the success rate for setting occultations. This was achieved primarily by modifications in our processing algorithms, and to a lesser degree by reconfiguring the receiver firmware. All satellites appear to be healthy and the whole operation is running more smoothly than ever. UCAR and NSPO are learning more about the operation of the GPS RO receivers, and with JPL's help the numbers of good occultations keep rising. TBB testing is ongoing and TIP operations are steadily improving. Starting on 28 July, COSMIC data is now provided officially for public release. This comes after successfully loading all satellites with JPL's latest software for the Radio Occultation receiver. Currently, there are between 35 and 40 daily COSMIC downloads and we are producing over 700 good occultations per day (on good days). UCAR is still optimizing ground processing, and we expect this number to increase over the next several days. TIP is fully operational, and TBB will be doing special testing over Alaska during the next week. Formosat-3/COSMIC data are now available. While data are posted starting on day 2006.111 we strongly recommend that users focus their efforts on data collected with receiver firmware version 4.2.1, starting on day 194, 2006. Because of many different issues with earlier data before day 194 CDAAC cannot support related questions/problems. Presently we provide fewer than 500 neutral atmospheric profiles and ~ 1500 ionospheric profiles per day. This is significantly lower than the planned 2500 daily profiles. (b) To avoid receiver memory overflow in these 8 hours we have to constrain the azimuth angle within which occultations are scheduled. (c) Most rising occultations still fail because of a receiver firmware problem. We still plan to meet the 2500 sounding/day goal. As the satellites are more evenly distributed we will begin to download data more frequently and then open up the azimuth angle. - This will help resolve (a) and (b). The JPL receiver group is working on (c) - since rising occultations are working better on SAC-C we don't see a fundamental issue here and expect that this problem will be solved. (d) is presently worked on by the NSPO satellite operations team. COSMIC is steadily increasing the number of payload data dumps per day. Currently, our data downloads scheduled is up to 39, up from about 14 a few weeks ago. This increase will reduce data latency and is in preparation for public access to the data. We still are processing between 350 and 400 atmospheric occultations per day due to our narrow azimuth collections and some problems we have been having with #2 spacecraft. We are processing around 1500 ionospheric occultations per day. These numbers are expected to increase as the spacecraft move apart. Orbit raising is on hold for now to devote efforts to improving and increasing the amount of occultation data processed. CDAAC is now generating around 370 occs/day, up from 200 or so last week. --More data downloads and fewer SSR/PC wrapping events. --A fix to LEO orbit code which eliminates many failed orbit jobs. --GOX firmware build 4.2.1 being uploaded to 5 of 6 satellites. 1200 - 1600 ionospheric profiles per day. COSMIC took a break from orbit raising this week to focus on science downloads. Much progress was made with an increase in occultations to approximately 350 per day downloaded from the satellites. It is expected that we will reach an average of 500 occultations per day by 15 July with all satellites operating. TIP is operating on all satellites and TBB turned on for 3 of the 6 satellites. The CDAAC is continuing to process all data that arrive from the COSMIC satellites. At this point we have processed about 17,000 (15,000 good) atmospheric and 28,000 ionospheric profiles from COSMIC. The quality of the profiles is generally good but depends on firmware version and varies with satellite and payload operation modes. Presently we are generating 200 atmospheric and 800 ionospheric profiles per day. The number is still limited by several factors. Mainly we are still not able to offload all science data from orbit before memory overflow. This has prompted us to constrain the field of view for tracking neutral atmospheric occultations to 30 degrees azimuth of bore-sight. We are still only tracking few rising occultations in the neutral atmosphere. CDAAC has tested results from a new firmware upload on FM4 and the results are looking good. Some additional firmware improvements are still needed. NSPO is now proceeding to upload this firmware to all FMs. After this is done NSPO plans to schedule more science data downloads. We expect to generate over 500 good neutral atmospheric profiles per day by mid-July. The plan is to open CDAAC and TACC data access when that number has been achieved and the new firmware has been uploaded to all satellites. COSMIC orbit raising is still making progress The cluster of 6 satellites is stretched along the same orbit with Satellites 3, 4, and 6 being the only satellites clustered together. Five of the satellites are at approximately 515 km altitude, while Satellite 5 has been moved to over 700 km altitude, on its way to 815 km. All GPS RO payloads are currently turned on most of the time, with the number of data downlinks steadily increasing. All TIPs are on and TBB is operating on 3 of the satellites. COSMIC orbit raising is proceeding. The cluster of 6 satellites are flying in a group that is approximately 5000 km in length. Five of the satellites are at approximately 515 km altitude, while Satellite 5 has been moved to 637 km, on its way to 800 km. Orbit raising is progressing slower than originally planned. All GPS RO payloads are currently turned on most of the time, but data downlinks are limited, which is limiting the number of occultations being processed. TIP and TBB are operating on 4 of the 6 satellites. COSMIC spacecraft are making good progress in deployment. Spacecraft 5 is now orbiting on its own at 600 km, away from the other 5 which are generally at an altitude of around 515 km as shown in the graphic on this web page. Orbit raising will start soon on Spacecraft 1 and 2. A new load of software for the GPS RO receivers is being prepared and should be loaded in the next few days. CDAAC is behind schedule releasing data to the public. Our goal at this point is to open up the data from CDAAC and TACC after the new upload of firmware has been confirmed. We expect this upload to improve L2 phase data (which will mostly affect ionospheric and stratospheric observations) and provide some rising occultations. We do not yet expect that rising occultations will work flawlessly. At this point we are generating only very few profiles - but things should improve as soon as (a) more data can be dumped to ground stations and (b) more GPS receivers are operated a higher percentage of the time. Orbit raising is progressing with successful test burns. COSMIC satellites all received a new load of software for the GPS RO payload over the past couple of weeks which allows us to start open loop tracking. TIP payload is operating 24 hours a day. TBB has started testing on all frequencies over various earth receiver chains. All spacecraft appear to be healthy. All 6 spacecraft are healthy and functioning normally. Spacecraft attitude has generally been good with spacecraft power margins better than expected. Payloads are being operated with the GPS payload on half time and TIP on full time. A new version of GPS payload software is in the process of being loaded to all 6 satellites. TBB is still going through its checkout process, operating occasionally. The constellation orbit maneuvering has been delayed due to a fairly long learning curve in calibrating burn profiles, but significant progress has been made over the past few days to prepare one of the satellites for its first maneuver. Attitude continues to look good for all satellites. For most of the week the GOX was commanded to be on for 24 hours. This caused some data buffer overrun issues for the GOX data transmitted to the ground stations and most of the data was not translated due to parsing errors. To correct this problem the GOX will be commanded to be on for 6 hours and other methods of reducing the data volume are being investigated. The limitation in the amount of observation data is due to the tight spacing of the SC in the initial phase, once the SC are in an operation orbit they will download data on a more frequent schedule. We have received good POD and OCC data with attitude stabilized, and we have been able to perform good orbit determination. We have been getting good profiles down to about 6 KM. The truncation of the profiles is due to known issues with the FM firmware for OL tracking. Version 4.2 should be delivered in the next few days. The newer GPS firmware will fix bugs related to OL mode and we anticipate getting good open loop data once this firmware has been uploaded to the spacecraft. We have been using predicted orbits for ionospheric processing. Currently we are in the process of calibrating DCBs for the spacecraft receivers. It is anticipated that COSMIC data will be used in a space weather campaign coming up at the end of June. We continue to look at TBB - GOX interference test data. CDAAC Computer systems are performing well and there have been no hardware related failures. Processing loads are becoming high on some of the web service servers and we may add an additional server for handling data requests. There was a hard drive failure in one of the BitGrabber systems in New Zeland and a replacement drive has been shipped. Attitude is now looking good for all s/c. This is expected to help POD. We are seeing reasonable SNRs on all antennas. FM4 started looking reasonable again on day 139. FB 4.1 test upload was done to FM3. Once we confirm this worked we will give the green light for uploading FB 4.2. JPL is working on FB 4.2 - several bugs that affect the OL model are fixed. There may be some more bugs. However we decided to upload FB 4.2 as soon as possible to start tracking near the surface while the satellites are still in low orbits. The space weather community is already planning a COSMIC test period. At this point we have processed over 1000 COSMIC occultations (to atmPhs level) and they are coming in faster and faster. May 16, 2006 CDAAC is planning on opening up access to users as soon as remaining satellite issues have been cleared up. We anticipate this will occur in the next 2-3 weeks. May 15, 2006 All 6 spacecraft are healthy and flying as a cluster approximately 900 km from end to end at 515 km altitude. At this low altitude, the spacecraft's attitude is not as stable as it will be at the final orbit of 800 km, so payloads are only being operated part time to save power. A flight software load is being completed over the next 2 days which is expected to significantly improve attitude stability, and should allow for longer duration payload operations. Orbit raising is planned to start during this next week, with the first spacecraft being boosted to the final orbit altitude of 800 km. April 15, 2006 The COSMIC constellation of six satellites was launched successfully from Vandenberg Air Force Base in California at 6:40 p.m. PDT (9:40 p.m. EDT) on Friday, April 14, 2006. Ground stations have received signals from all six satellites. Translation bug fixed in BUFR files (bfrPrf). New post-processing version number is 2005.3091. To view the files for post-processing log into the CDAAC Data Access, and go to champ/level2/bfrPrf/YYYY.DDD directories. New Real Time version number is 0001.0003. Real Time BUFR files are available by going to the CDAAC Data Access in the champrt/level2/bfrPrf/YYYY.DDD directories.